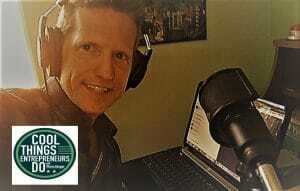 Are you seeking to hire a podcast host for your company or association podcast? Getting on air talent from outside your company may be just what you need to ensure you show gets a professional host who is committed to growth. Hiring outside talent to host your business podcast is a great idea, but there are not many places to turn to uncover experienced podcast hosts who will have the business experience you need to ensure they represent your company in the marketplace. When you search for the topic of finding a third party experienced podcast host you will find countless articles for podcast producers and those who can edit podcasts. Outsourcing the recording of intros and outros, creating show notes, and overseeing blog post entries and social media have been available for years. But if you are seeking to hire a podcast host from outside your company to conduct interviews and represent your company, there is not much information available. Thom Singer has been hosting his “Cool Things Entrepreneurs Do” podcast since 2014. With nearly 500 episodes to date, he has interviewed hundreds of business professionals about a variety of topics around growth and success. He has an eclectic background in sales, marketing, and management in large and small companies, and has spent a decade as a processional keynote speaker. After nearly five years in the podcast game, Thom discovered that there is a need for great hosts to be matched with corporate partners who want to launch their own business podcasts. Having worked closely with the speakers bureaus who help connect professional speakers with those hosting live events, he is developing a similar model for long-term and short-term engagements for podcast hosts. Why hire and outside podcast host? There are many reasons why you would look toward professional podcast talent to host your company’s podcast. With a crowded field of podcasts in every possible topic, how your present your show matters. It is not just about great editing (although that matters too, and if you are seeking someone to handle the technical work for your show, check out Podfly Productions), but a professional and consistent host to whom people can relate to and feel connected. Commitment to ensuring the show is released on a regular schedule. Eliminates professional jealousy among company employees (should the show become wildly successful). In addition to his own services as a outsourced podcast host, Thom has begun collecting the names of other experienced podcasters who are interested in hosting shows for associations and companies. This makes Thom Singer as the first Speakers Bureau for Podcast Hosts (as far as he knows at this point).